“Hundreds of protesters are gathering in Washington DC to demand “No coup! No war! No sanctions!” on Venezuela, and show support for Venezuela President Nicolas Maduro against regime change efforts. AMY GOODMAN: Glenn Greenwald, I also want to talk to you about Venezuela. An investigation by The New York Times found several trucks carrying so-called humanitarian aid that were set ablaze during a showdown at the Colombia-Venezuela border last month were not caused by President Nicolás Maduro’s forces, as was widely reported at the time by both media and Trump administration officials. This is Vice President Mike Pence. VICE PRESIDENT MIKE PENCE: Maduro’s loyalists turned on their own people. As the world watched, they set fire to trucks loaded with food and medicine desperately needed by the Venezuelan people. Glenn, your latest piece is headlined “NYT’s Exposé on the Lies About Burning Aid Trucks in Venezuela Shows How U.S. Government and Media Spread Pro-War Propaganda.” Talk about the latest in Venezuela and how this has fueled that. GLENN GREENWALD: Every time the U.S. wants to start a new war, it does it the same way, which is, it invents some really inflammatory, emotionally wrenching lie that gets people to hate the government they want to topple so much that they set their rationality aside and support the war. So, they claimed North Korea—or, North Vietnam attacked U.S. ships in the Gulf of Tonkin, which was a lie to start the Vietnam War. They claimed that Saddam had been ripping babies out of incubators in Kuwait, to start the Gulf War, which was a lie. They claimed weapons of mass destruction, which was a lie, to start the Iraq War. And now you have Marco Rubio and John Bolton and Elliott Abrams, the crew, the neocon crew, who are experts at lying to start wars, going around telling lies about what the Maduro government is doing. And regardless of what you think about the Maduro government or President Maduro himself, you should be highly angry when your own government, with the help of its media, lies to you in order to start a war. And this incident on February 23rd was incredibly important because that imagery of burning humanitarian trucks was very powerful. And the claim that it was Maduro’s forces that did it came not just from Marco Rubio, who cited anti-Maduro media outlets with no evidence. CNN—CNN—lied to the world. They claimed that their own journalists witnessed with their own eyes Maduro’s forces throwing incendiary devices that set those trucks on fire. Right away, independent journalists, including Max Blumenthal, as well as Dan Cohen, who works at RT, looked at and studied—they were in Venezuela—the available footage and said that it was clear that it was the anti-Maduro protesters who set those trucks on fire. 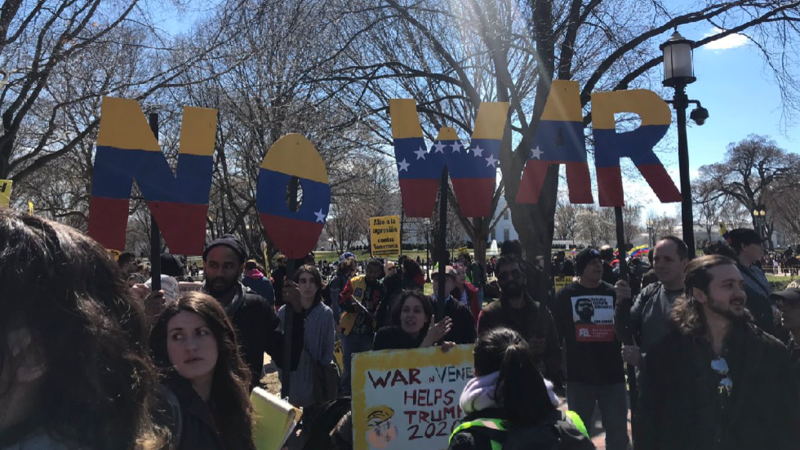 But those people were ignored by the corporate media in the United States, which only paid attention to the people who were lying on behalf of the U.S. government, only aired the lies that it was the Maduro forces who did it. And then, suddenly, The New York Times comes out with a good exposé that proves that it was a lie. They didn’t bother to credit any of the independent journalists who did it two weeks ago using much of the same evidence, but they did show that it was a lie. And since then, Marco Rubio has got caught in two other lies. He claimed that babies were dying in hospitals, and then The Wall Street Journal reporter in Venezuela went to that hospital and said no babies had died. And also he claimed that a dam, that he called the German Dam, had collapsed because of the energy shortages, when, in reality, there was no dam that collapsed. The person who reported it was named Germán Dam, and Marco Rubio confused that and thought that it was a dam that had collapsed. So he’s running around Venezuela telling all kinds of lies, acting like a buffoon and a clown, with John Bolton and Elliott Abrams in tow, in order to try and start a new war in Venezuela. And as usual, the corporate media—unlike Democracy Now!, which has put Venezuelan officials on to give the other side of the story, the corporate media in the U.S. have completely excluded any questioning or dissent of any of these storylines and have allowed these lies to go unchallenged, and, in the case of CNN, have often vouched for the lies themselves. AMY GOODMAN: So, I wanted to go to this issue that you just raised, local reporting emerging that ongoing power outage has killed 17 people in hospitals, where backup generators failed; President Maduro saying last week anti-government saboteurs backed by the U.S. took the nation’s main hydroelectric power station at the Guri Dam offline; meanwhile, The New York Times reporting the sanctions have affected Venezuela’s ability to import and produce the fuel required by the thermal power plants, that could have backed up the Guri plant once it failed. If you could respond to all this, and especially President Maduro’s accusation that the power outage, which has plunged the country into darkness, though the electricity is coming back now, was as a result of a plot backed by the United States? GLENN GREENWALD: Well, one really interesting part of that New York Times exposé that got very little attention, was buried within, I think, the 12th or 13th paragraph, was an acknowledgment that the reason for the power outages, at least in large part, were the sanctions that the U.S. has imposed on Venezuela, that has made it impossible for Venezuela to get the energy that it needs to provide to its people. And so, as usual, the sanctions regime that’s being done in the name of helping the Venezuelan people is one of the biggest factors in their suffering deprivation and misery. This entry was posted on Monday, March 25th, 2019 at 00:05	and is filed under Uncategorized. You can follow any responses to this entry through the RSS 2.0 feed. Both comments and pings are currently closed.